The Communication Workers Union (CWU) is going to the High Court on Friday to seek an injunction preventing Royal Mail from using 30,000 agency workers. It accuses Royal Mail of using agency workers as strike breakers to do the work of CWU members involved in the continuing UK-wide industrial dispute. 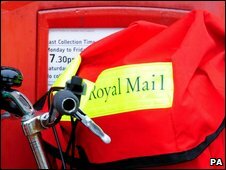 Royal Mail said its use of temporary staff was "entirely in line with all employment law". Talks between the two sides to end the strikes are due to resume on Tuesday. "The up to 30,000 directly engaged, fully vetted temporary workers being hired by Royal Mail to help us clear any mail delayed by strikes, and help with Christmas volumes are entirely in line with all employment law," said a Royal Mail spokeswoman. "In addition we normally use agency staff throughout the year to help cover sick and holiday absence and fluctuations in volumes, as well as higher volumes at Christmas. "These agency workers are not hired to do the work of postal workers when they are on strike and also completely in line with employment law." Guy Lamb, an employment law partner at legal firm DLA Piper, said the CWU's legal challenge was unlikely to succeed. "Despite the rhetoric of the Communication Workers Union, Royal Mail is not directly breaking any law by bringing in temporary workers during strike action," he said. "The laws to prevent the use of temporary workers to cover striking staff actually only apply to the employment agencies who provide the workers." Mr Lamb added that as such agencies are regulated by the Department of Business, any decision to take action against them is the responsibility of Business Secretary Lord Mandelson "who has already stated that he doesn't believe any regulations have been broken". CWU members are due to hold their latest walkouts on Friday of this week and on Monday, 9 November. Unlike the previous five 24-hour strikes, which have involved members in different roles striking on different days, the two new dates will be all-out action including up to 121,000 union members on each day. The dispute is over pay and modernisation at the Royal Mail. Royal Mail says it is trying to modernise to compensate for letter volumes dropping by 10% every year as people switch to other forms of communication such as e-mails and texts. It has shed 63,000 frontline postal staff in recent years and says it needs to cut more jobs as part of continuing modernisation plans. Royal Mail said the number of letters delayed as a result of the latest strikes had fallen from 50 million over the weekend to 25 million.